Another year has gone by in a whirl of politics, hurricanes and learning a new job but through it all my photography has been my happy place. When I take my camera and go wandering through a park, a botanical garden, a National Park or any where else, my worries and anxieties all melt away for that bit of time! In 2017 I did not get to travel out of Florida as much as in the past few years with the new job and all. So I spent many weekendsdriving to the various botanical gardens in Florida and, as always, hitting my favorite birding spots throughout the year. The big trip was in August this year when I joined a few of my photographer friends (that I went to Maine with in 2016) on a week-long trip to Yellowstone National Park and Grand Teton National Park. Lets start a bit more closer to home at the Florida Botanical Gardens in Largo, Florida. 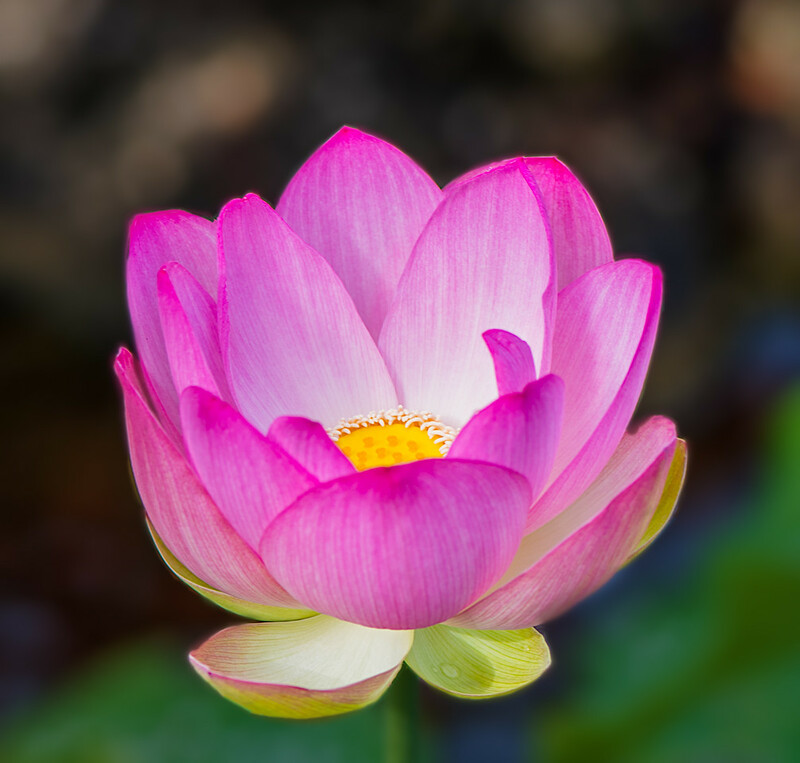 I have always loved Lotus flowers but this one is by far my favorite as it inspired me to look at the how of my photography which led me to write 2 of my most popular blog posts, “Timing is Everything” and “Ups & Downs of Photography“! I will be going back to that botanical garden again in 2018 for sure! When I lost my job in December of 2016 I did not think it would be prudent to go looking for a new job until after the holidays so to keep busy I decided to do as much photography as possible and that continued on into 2017. In December 2016, I purchased an annual pass from BokTowers Gardens in Central Florida. That membership gave me free or discounted access to a long list of other gardens in the state. So the spring of 2017 was all about the flowers and dinosaurs!! As an almost life long Floridian I sometimes forget about all the places that are around the state as we “Floridians” usually try to stay way from the touristy places. But by doing that we miss out on some really cool stuff! 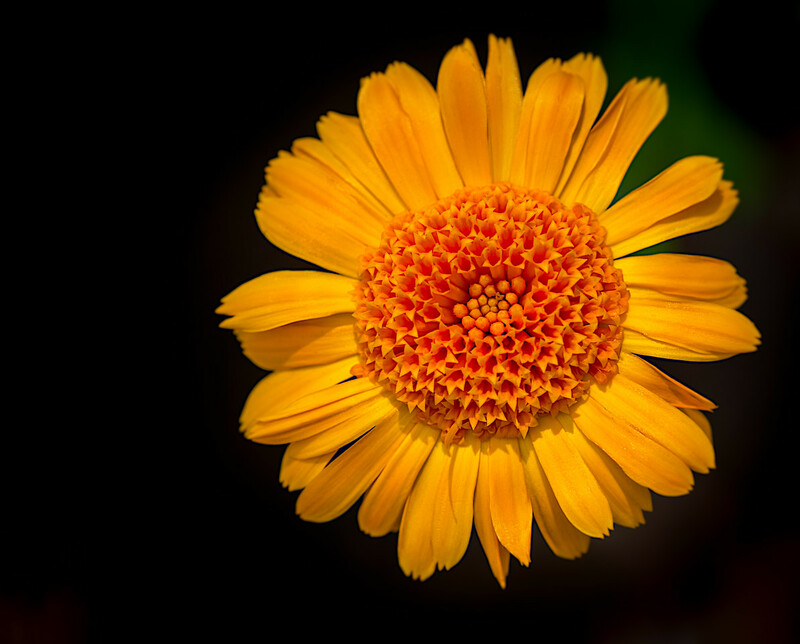 I lived in Orlando for years as a kid and most of my family still lives there so I was very surprised to find a beautiful botanical garden a few minutes from downtown. The Harry P Leu Gardens is a peaceful respite from the bustle of Orlando. I found a garden full of annuals that I could not stop shooting until I was about to die of thirst as it was in the full on spring sun! They have huge rose gardens and other themed gardens. This gorgeous place is a popular wedding venue as well! 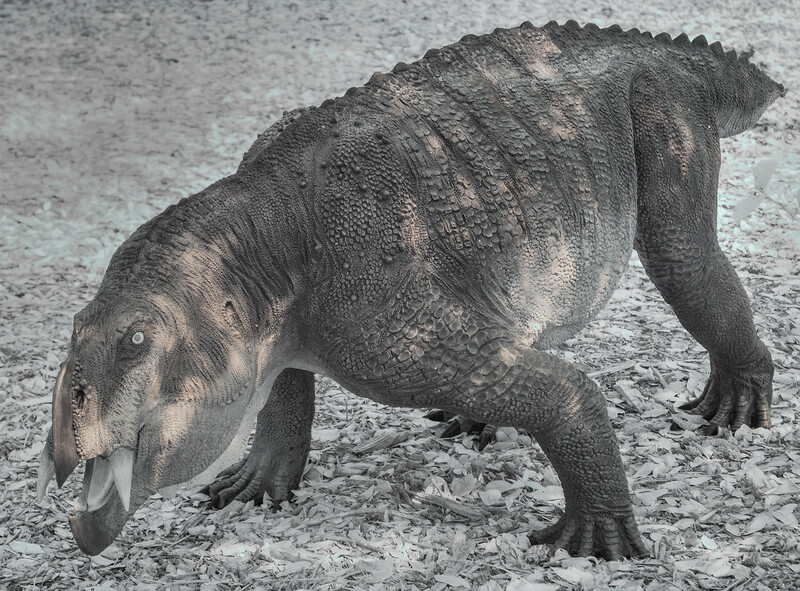 Leu Gardens had a dinosaur exhibit going on when I visited the gardens so I had to include my favorite dinosaur image! The kids absolutely were gaga over these creatures scattered all over the gardens. I took this image with my infrared converted camera to give it an other worldly look! I traveled across the state to Vero Beach to visit the McKee Botanical Gardens. This had been one of the old roadside attractions started back in 1929 as McKee Jungle Gardens. It was taken over and revived as a botanical gardens a few years back. Their water lilies are the main attraction. They were everywhere! There were so many varieties and colors it was hard to pick my favorite. I carried a second camera with me to all the botanical gardens as infrared photography was just made for trees & plants! 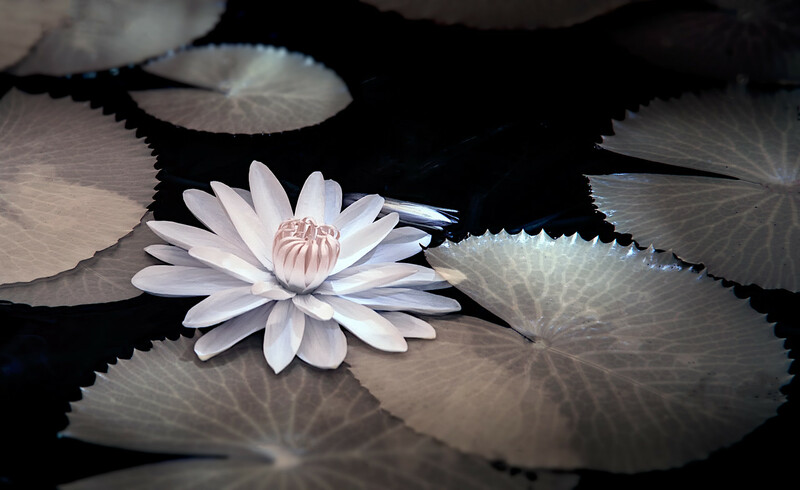 This infrared image is all about the shapes of the water lily and the lily pads! I also visited Sunken Gardens in St Petersburg, Kanapaha Botanical Gardens in Gainesville, USF Botanical Gardens in Tampa and Marie Selby Botanical Gardens in Sarasota. But what about the birds? There were some challenges this year for my favorite birding places. We had a very dry summer and most of the parks where the birds are found are water management areas. With the dry conditions, the ponds and drainage ditches where the birds feed and hangout were dried up. So looking for water oriented birds was not easy. Then Hurricane Irma struck Florida in early September. That took care of the drought conditions for awhile but it also meant that levees and trails were washed out and trees were down throughout the parks. As of January 1, 2018 we have access to all the birding parks I love but not full access. Most still have trails or roads that are deemed unsafe at this point. Each park is working as fast as they can to repair or replace their trails so all areas can be accessed and enjoyed. One of the parks that is fairly close to my home is Circle B Bar Reserve in Lakeland. They suffered a lot from the hurricane as the eye of the storm was very close. They are still dealing with downed trees and a major trail that was washed out. But the water is back and the birds are plentiful! I had a difficult time choosing my 2017 favorite from all the images from this amazing place but this one came to the top. 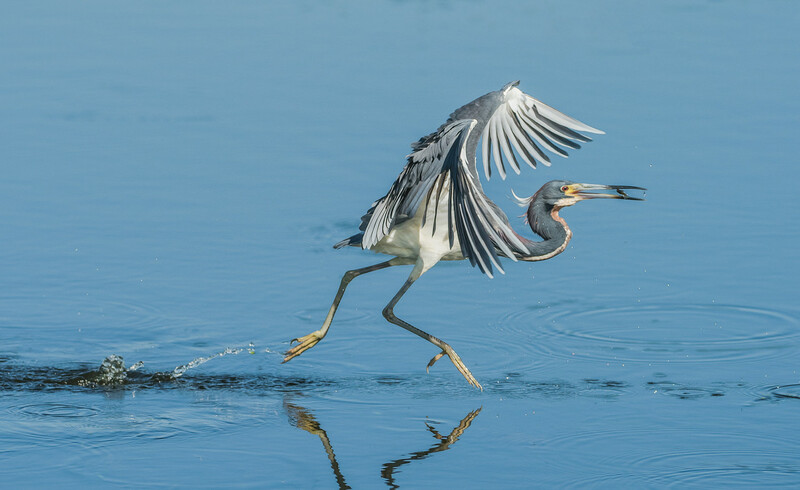 This is a Tri-Colored Heron “walking” across the water with a tiny fish he just caught on the fly! This one has gesture on top of gesture! Another favorite birding spot is also still in recovery, it only reopened in late December and access is still limited. Lake Apopka North Shore Wildlife Drive is in Apopka. This is a long loop one-way road that takes you by ponds, lakes and ditches that are full of birds. 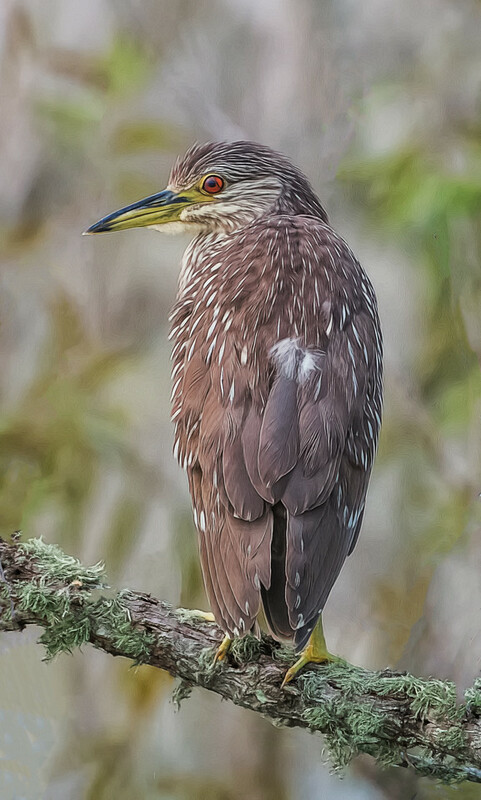 This young Black Crowned Night Heron was my 2017 favorite. The Bradenton/Sarasota area is another hot FL birding area. I made it down there several times this year. The Celery Fields is a water management area and so was very dry in the summer. This park does not have trails or trees so it fared better in the storm. The ponds/lakes are often full of feeding egrets, herons, ibis and other shorebirds. Spoonbills make an appearance as well. But my favorite image from the area actually was captured down the road a bit, across from a housing development. 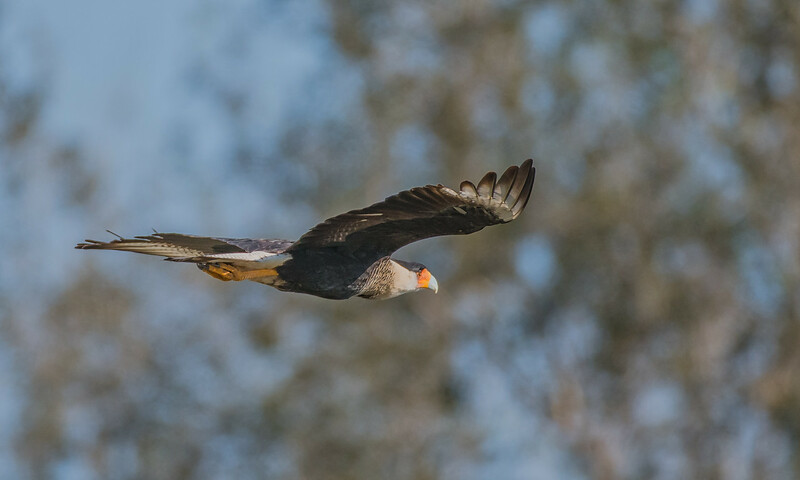 I have wanted to see and photograph a Crested Caracara for years. On December 26, 2017 I found one and got an image of him sitting on a pole but also as he flew away! They are fast and I was thrilled to catch him in flight! 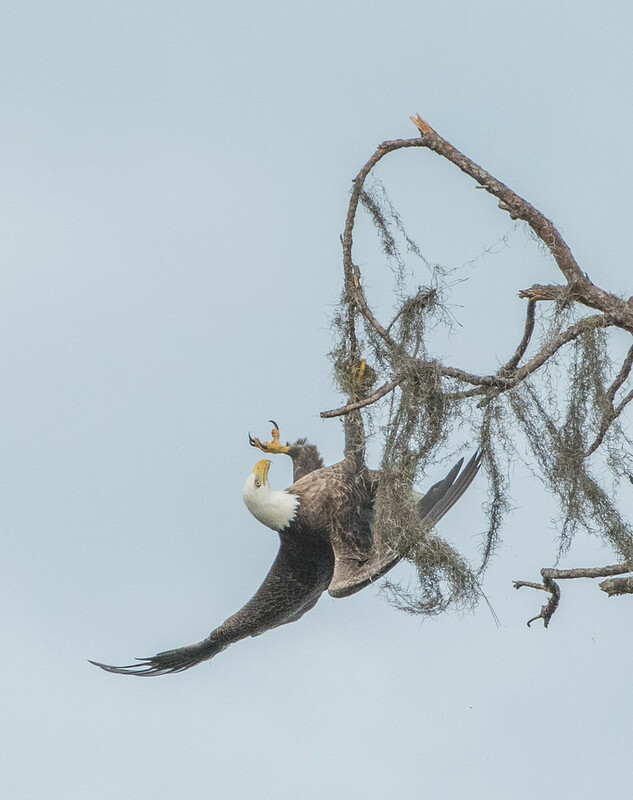 A bit north in the Lakewood Ranch area is an eagle nest that has been photographed the last few years. I got to spend a couple of mornings there enjoying the work that goes into an eagle nest and the thrill of watching these gorgeous birds. To see an eagle literally fly upside down to pull a dead branch from a tree was amazing! I studied animal behavior in college so I am always looking for some type of action to capture in my images… this was one of those times! Last but not least, by any means, is the trip out west to Yellowstone National Park, Grand Teton National Park and the surrounding areas. We were there for a week in August but we could have used at least a couple more, as there is so much to see and experience. We managed to spend time in Idaho (where we stayed in a gorgeous house), Wyoming (the majority of the 2 national parks are in this state) and Montana (where we visited a couple of ghost towns). I put over 2000 miles on the rental vehicle in a week so we did cover a lot of ground! Picking just one image from this trip was just too difficult so here are several and their stories! When you think of Yellowstone you think of bison. We saw plenty of them, some were right up at the car! They cause massive traffic backups as the herd slowing crosses the road. These two were on a ridge above the road in Hayden Valley and I liked the backlighting so this was my favorite bison image. 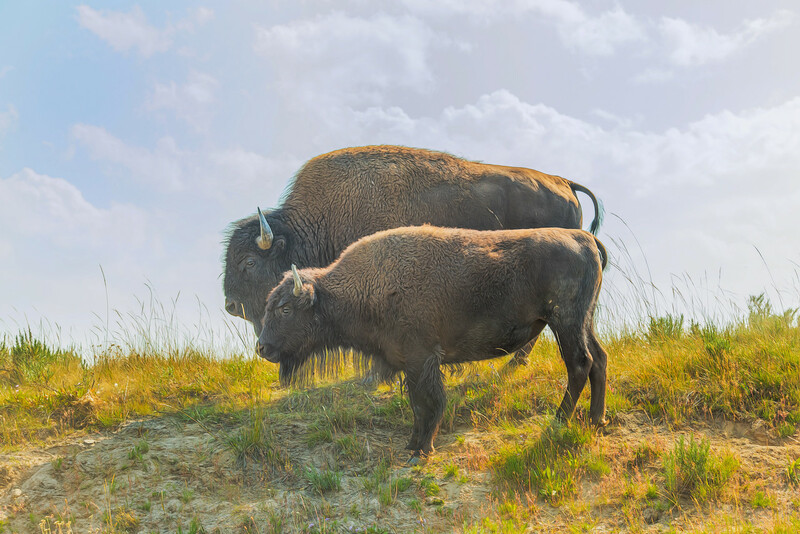 This image was shot from the car… not getting out when bison are nearby! The bull was courting the cow but she quickly rebuffed him just after I clicked this image. Being a Florida girl, mountains of any size are impressive, but the Grand Tetons took my breath away every time I saw them. The fact that there was snow on many of the peaks while we were roasting down in the valley in August made them even more impressive. Due to wildfires in Idaho & Canada at the time, a smokey haze was present most of the time we were there. But I did discover that my infrared converted camera “saw” through most of that pesky haze. 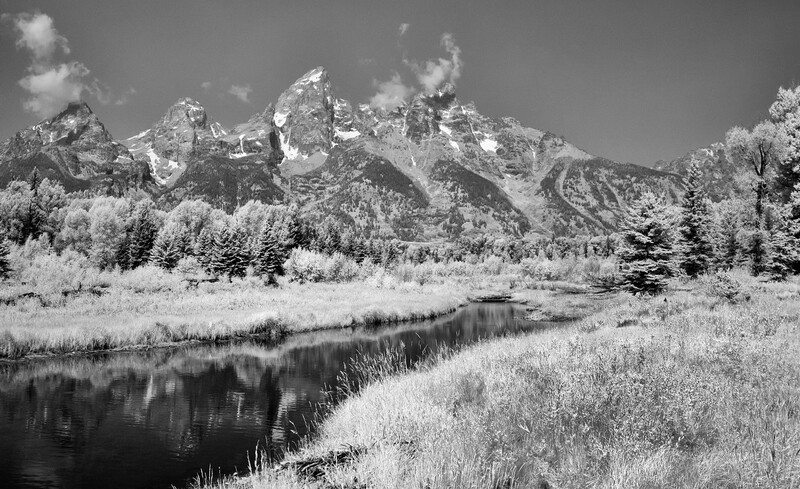 So my favorite Grand Teton image is an infrared image. This image was made at Schwabacher Landing in Grand Teton National Park. I just wish the water had been a bit more still to get a better reflection. But look at the snow! 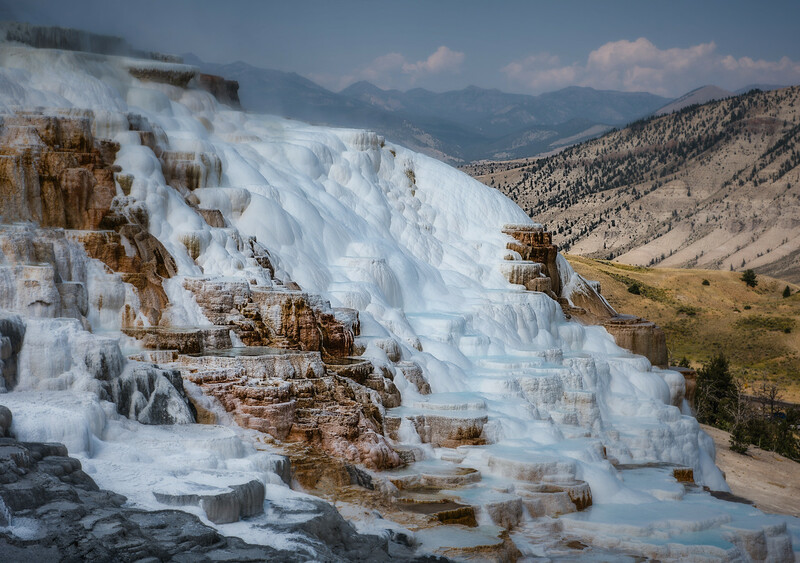 One of my must see places was Mammoth Hot Springs. That place is like being on another planet! The colors, smells, sounds of the place were almost overwhelming but I climbed the many stairs that take you around this natural phenomenon and kept clicking that shutter. 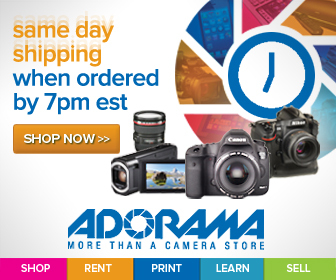 Actually that day I was using 4 cameras as part of a fun challenge we had on this trip! My favorite image was at the end of this long boardwalk. I could have stayed there for hours but the platform was small and many people wanted to see this awesome sight! The last favorite image for 2017 is a favorite for several reasons. This image was made after climbing up a mountain trail that overlooked the Grand Prismatic Geyser in the Midway Geyser Basin in Yellowstone. We had visited the area at ground-level very early that day and our first glimpse of the Grand Prismatic was through a thick haze of fog and steam. The colors that are why this spot has the name it has were barely apparent in those hazy conditions. So upon arriving at the viewing platform above the geyser basin later in the day, I, as well as everyone up there, was in awe of the sight before our eyes! 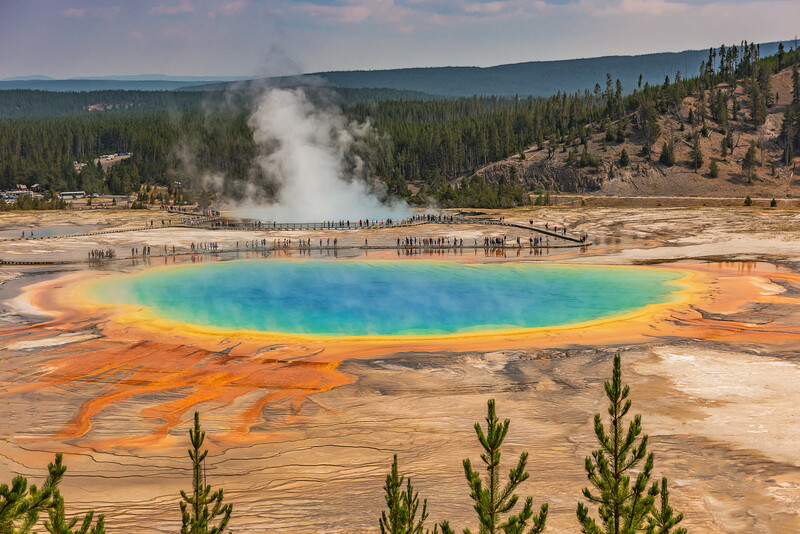 The Grand Prismatic is unbelievable but it is real! The other reason this image of the Grand Prismatic is one of my favorites in 2017 is that I received a request from my friend, renown photographer and the Godfather of Photography, Rick Sammon, to use this image in his KelbyOne photography class about Yellowstone & the Grand Tetons. He was not able to get to the viewing platform when he was in the area filming the class. I am extremely thankful to Rick for his use of my image and for all the mentions on social media. Please check out my blogposts on all these adventures as well as my photo galleries. Ok, that is all for 2017. I am looking forward to 2018 and all the adventures and images that the New Year will bring. Keep on making those images!